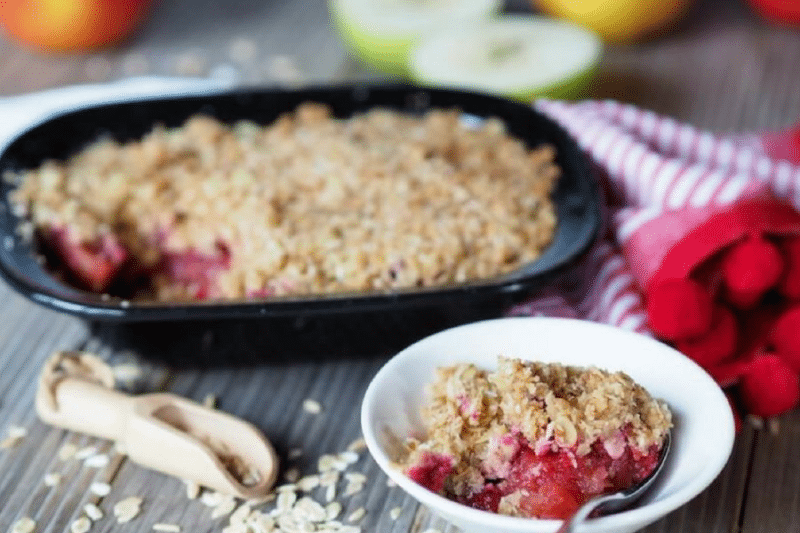 Okay, this apple and raspberry crumble is a twist of the traditional humble apple pie, and it’s sooooo good!! We made this for a family dinner we had at Mum & Dad’s and everyone loved it. Topped with a big scoop of vanilla ice-cream and you’ve got a winner. You could replace the oats with a little more coconut if you’d like to make this gluten-free. Cut up the apples into large chunks, or slices and place into a large pot. Cover with water and simmer (don't boil) until just tender (approx. 5 mins from when the water comes to a simmer). Drain off the water, and add sugar, cinnamon, mixed spice and raspberries. Gently stir to coat the apples. Place apple mix into an oven safe dish and set aside while making the crumble. Combine all the crumble mix ingredients in a bowl and mix until well combined. (If using a Thermomix, add all ingredients and mix 5 secs/speed 3/reverse). Sprinkle over the apples and bake for 30-40 mins (or until nice and golden on top). Serve warm with a drizzle of fresh cream, a dollop of ice cream or vanilla custard. Enjoy! Your crumble mix is not correct .. You have your apples and raspberry ingredients as the crumble mix. Thank for the heads up. I have updated this recipe. Sorry, Shane .. Still a few issues with the ingredients and instructions. You have 1 cup of flour in the ingredients but do not include it in the instructions. I believe the crumble ingredients should also include the melted butter, coconut, rolled oats, flour, mixed spice, cinnamon and raw sugar. I just find the way the ingredients and instructions are very confusing. Yes it appears the ingredients and instructions are still night mixed up. Would be good if it could be corrected. Thanks for your comment. This has been corrected.